It's finally happening. Today marks the official, long-overdue launch of the Essential Phone PH-1 with Essential and Sprint making announcements that you can pre-order Andy Rubin's new device today. Both Essential itself and Best Buy have the unlocked model for $699, and Sprint will be the exclusive carrier in the U.S. Both versions of the phone will work on all major U.S. carriers. Speaking of Sprint, however, the company is offering an interesting and sweet deal for the launch. Going through its Sprint Flex Lease program, you'll get 50% knocked off the price of the phone, meaning that your monthly payments will be just $14.58. And for a limited time, if you purchase the phone through Essential, you can get the 360° camera for another $50. All three outlets are showing as "Reserve," "Pre-order," and "Coming Soon" for me at the time of writing. Also, it looks like you can only get the black model through Sprint at the moment; the white one will be "available at a later date." There will be a few source links below, so pick which one best suits you. Also, keep in mind that Sprint says that "full retail availability is expected within a few weeks," which makes me wonder about Essnetial's claim that previous pre-orders will be shipping with the next week. Starting today, Essential Phone is available on Essential.com, Sprint and Best Buy. Essential Phone is compatible with all major carriers. 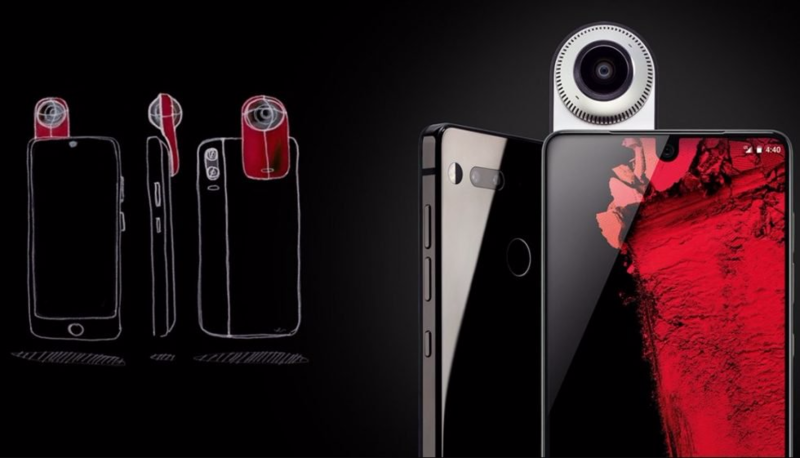 OVERLAND PARK, Kan. & PALO ALTO, Calif. (BUSINESS WIRE), August 17, 2017 - Today Sprint (NYSE: S) and Essential Products announced the beginning of pre-order for Essential Phone, the first smartphone from Essential Products, started by Andy Rubin, co-founder of Android, the world’s most widely used operating system. Essential Phone is expertly crafted using titanium and ceramic, has an edge-to-edge Full Display, and captures stunning images (even in low light) with a color and monochrome dual-system camera that captures rich, crisp photos. Sprint is the exclusive U.S. retail carrier for Essential Phone. Sprint will be the only carrier where customers can walk in and experience the beauty of Essential Phone before making a purchase. Customers who wish to be among the first to get Essential Phone can pre-order it in black now at www.sprint.com/essential. It will be available in white at a later date. Full retail availability in expected within a few weeks. For a limited time, get 50 percent off Essential Phone and pay just $14.58 per month with $0 down with 18 Sprint Flex Lease payments1 – that is a savings of more than $260. Plus, get the Essential 360° Camera, the world’s smallest 360° 4K camera, for just $199.99 or $16.67 per month for 12 months with Installment Billing2. With Sprint Flex Lease, customers can lease Essential Phone and have the option to upgrade or purchase later. Unlike other carriers, which require the customer to decide to buy up front, Sprint lets customers make the final decision later, so they don’t get stuck with their old phone. Sprint Flex allows customers to enjoy their phone before deciding what option (upgrade, continue leasing, return or own) works best for their lifestyle. Customers can still choose to buy the phone outright at point of sale. Sprint offers the best price on Unlimited – a family can get five lines of Unlimited data, talk and text, HD video and 10GB of mobile hotspot for just $20/month/line. That’s five lines of Unlimited for $100/month and 50 percent off Verizon and AT&T Unlimited rates for a family of five.3 Sprint has more spectrum than any other carrier across the nation, allowing Sprint to keep adding the capacity and speed needed to serve customers’ increasing demand for unlimited data. Design & craftsmanship: There’s a reason titanium is used to build rockets and replace bones. Unlike aluminum, which is what most phones are made of, titanium doesn’t scratch, dent, or bend. Titanium is the perfect material to create one of the most essential things in our lives – one we all sometimes drop. World’s Smallest 4K 360° Camera: Other 360° cameras are big, bulky, and complicated to use. We thought it was about time someone made a 360° camera for the rest of us. Simply click the 360° camera to your phone to point, shoot, and share. It’s that easy. Full Display™: With the Essential Phone’s stunning edge-to-edge Full Display there’s finally a large-screen device that fits comfortably in the palm of your hand. Beauty meets brawn: This phone will take on whatever you want it to do. It comes with top-of-the-line specs and 128GB of memory so you have plenty of space for apps, photos and music. Accessories that simply click: The magnetic connector with wireless data transfer keeps your phone cord-free, future-proof, and always up-to-date. Essential Phone is enabled with three-channel carrier aggregation capable of reaching peak download speeds of more than 200Mbps. With an average of 204MHz of spectrum and more than 160MHz of 2.5GHz spectrum in the top 100 U.S. markets, Sprint has more spectrum than any other carrier across the nation, allowing Sprint to keep adding the capacity and speed needed to serve customers’ increasing demand for unlimited data.